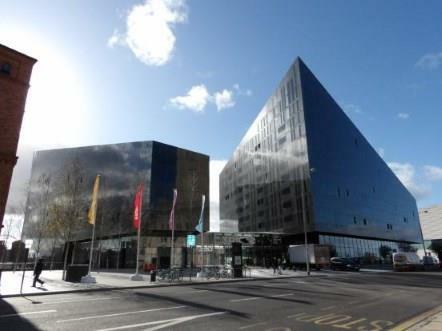 Entwistle Green are delighted to offer for sale this two bedroom apartment situated on the fourth floor in the very modern and sought after Mann Island development. Inside you are greeted by an ultra modern atrium. The property comprises of hallway, open plan lounge with modern kitchen and stunning views of the famous Three Graces and the Pier Head. Two double and stylish bedrooms, one with a fitted wardrobe and a generous size family bathroom. The property benefits from secure allocated parking, 24hr concierge and is close to all amenities. Laminate flooring, built-in storage cupboard, spotlights. Double glazed aluminium window facing the front. Electric heater, laminate flooring, spotlights. Modern wall and base units, stainless steel sink, integrated, electric oven and hob, integrated fridge/freezer. Laminate flooring, tiled splashbacks, ceiling light. Aluminium double glazed door opening onto a internal balcony. Carpeted flooring, fitted wardrobes, ceiling light. Double glazed aluminium window facing the rear. Electric heater, carpeted flooring, ceiling light. Low level WC, panelled bath, shower over bath, wash hand basin. Heated towel rail, tiled flooring, tiled splashbacks, spotlights.